To celebrate the fact that Virgin Atlantic and Delta Air Lines fly to over 200 destinations in the US, the airlines are opening a 'Joint Venture' pub in London, selling craft beers from many of those cities, including Seattle, Atlanta and Miami. It's a ten day take-over of The Old Crown pub at 33 New Oxford Street, and will feature lots of bottled and canned beers, shipped over specially. A great idea, and a great way to taste some of these beers. There will also be special nights organised, including quizzes, and nights devoted to some of the cities - details here. See you there! 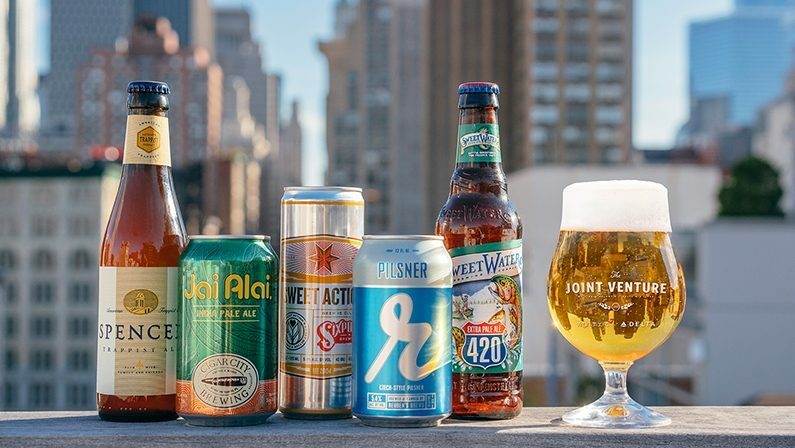 "From Siren Blonde Ale in Memphis to Modern Times in San Diego and Pick Axe Porter in Anchorage, a new pop-up pub serving 230 US craft beers is landing in London on 10th August. Celebrating the rise in popularity of craft beer, Virgin Atlantic and Delta Air Lines are opening The Joint Venture pub on New Oxford Street, Holborn, bringing people together to enjoy a taste of the 200-plus US destinations that UK travellers can fly to with Virgin Atlantic and Delta. From 10th – 19th August The Old Crown Public House will turn into The Joint Venture where the American craft beer scene meets the traditional English pub vibe complete with a beer wall installation. Open to all from noon until 11pm, unique and local beers from all over the US will be available from £4. There will also be themed nights celebrating US culture plus a pub quiz with flights up for grabs. Boston: Spencer Brewing Trappist Ale (6.5% ABV)"